Parents of a child with special needs share a very big fear: what will happen after they are gone. Planning for that future is not just legal and financial it is also about creating the customized supports they need to live a full life in the community. Most parents do not want their son or daughter to move in with their other kids. While they often expect the siblings to be there for their brother or sister as their advocate and be very much involved in their life they do not want them to be responsible 24/7 as their primary care giver. Therefore, parents are often looking for residential options and meaningful day experiences as soon as a child ages out of special education, the day before they turn 22. There are three main options that families often choose in Illinois, First, there are campuses called ICFDDs. These include places such as Misericordia or Lamb’s Farm. Second, there are CILA’s (commonly referred to as “group homes”) where individuals with special needs often live with a few other individuals in a home in the community with staff that stay with them usually 24/7. 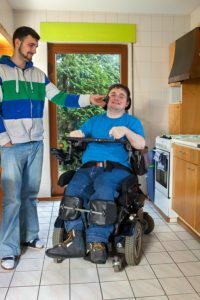 Third, others may choose independent living where the individual lives in their own home, with some form of weekly or daily support, such as meals, transportation or help in bathing and grooming. Whichever path your family chooses, it’s best to consider establishing a special needs trust, which can help pay for things not covered by government assistance. A trust also would subsidize their living expenses and additional support they might need, all the while keeping important government programs and assistance intact. For individuals living in either a group home or a campus the cost of their care will generally range from $50,000 per year to more than $100,000 per year, making it crucially important that individual is eligible for Medicaid to pay for those costs and a special needs trust be available as a reserve fund to pay for things that make their life more fulfilling. There are different trusts to choose from that can help your child with special needs. A self-settled special needs trust, often called a first party special needs trust, is often set up when the child has received money directly through an inheritance or a personal injury lawsuit. A self-settled trust must be established by the individual with special needs if they are legally competent, or the parent, grandparent, guardian or the courts. Only the child with special needs can be the beneficiary. Self-settled trusts must include a provision directing the trustee, if the trust contains any funds upon the death of the beneficiary, to pay back anything the state Medicaid program has paid for the beneficiary. Also, the rules governing permissible distributions for self-settled special needs trusts can be more restrictive than a third party special needs trust. As of a new federal law passed in December 2016, a person who has the capacity and who does not have a legal guardian can set up his or her own first party special needs trust.